Newly opened is a Downtown L.A. location in Little Tokyo with an expanded menu, a full bar and an inviting patio. Think Vinny’s Fried Chicken Sandwich with Adobo marinated chicken, honey habanero slaw, aioli and served on a brioche bun. There are also three new Sausages including the Angelino. That’s a cheddar jalapeno hot dog with bacon bits, black bean puree, avocado crema and pico de gallo. On the Adult Beverage side of the menu is the Seoul Sista with rum, lime juice, pineapple juice, and matcha coconut cream. There are also three handles of local craft beer on draft in addition to a selection of bottles. Simon Majumdar is a food writer, broadcaster, Food TV personality, and author of the recently published, Fed, White and Blue – Finding America with My Fork. 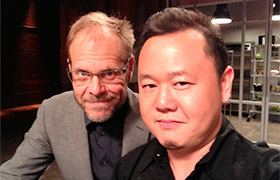 You know him as the no-nonsense judge on Food Network’s “Cutthroat Kitchen” with host Alton Brown. In fact, Mr. Brown penned the enthusiastic Forward to Fed, White, and Blue. Simon is probably not your typical idea of an immigrant. As he says, “I’m well rested, not particularly poor, and the only time I ever encountered “huddled masses” is in line at Costco.” But immigrate he did, and thanks to a Homeland Security agent who asked if he planned to make it official, the journey chronicled in Fed, White, and Blue was born. In it Simon sets off on a trek across the United States to find out what it really means to become an American, using what he knows best: food. Chef Andrew Gruel of Slapfish is today’s Guest Host. Chef Jet Tila, the emeritus host of the “SoCal Restaurant Show,” will be there performing cooking demos on Saturday for Idaho Potatoes. Jet joins us from the floor at the Produce Marketing Association’s Fresh Summit Convention & Expo at the Anaheim Convention Center. He’s doing cooking demos at the Idaho Potato booth. About 20,000 attendees will pass through there on Saturday and Sunday. Vancouver, British Columbia is a wonderful food town. The Fairmont Waterfront in downtown Vancouver also has a reputation for culinary excellence. Dana Hauser, Executive Chef at The Fairmont Waterfront, hails from Newfoundland and brings a passion for regionally-inspired cuisine. Her culinary philosophy (influenced by the abundance of just-caught seafood) continues to focus on an appreciation for the freshest of ingredients sourced from neighboring farms and artisanal producers. The chef’s bench offers communal dining. Power lunches get guests in & out in an hour. Our guest, Marc Witney, is the Outlets Manager for The Fairmont Waterfront. The “SoCal Restaurant Show” recently was aboard Holland America Line’s ms Zaandam on the Vancouver, BC to San Diego sailing of a longer 22-day Inca Discovery Tour ending in Valparaiso, Chile. An internationally respected food authority with 30 years of hospitality and cruise industry experience, Chef Rudi is perhaps the most highly decorated chef working on the world’s oceans. He is considered one of the hospitality industries most innovative and peripatetic chefs. Chef Rudi has authored 13 cookbooks including his most recent, Holland America Line’s Appetizer’s (Rizzoli, June 2012.) Chef Rudi’s books can be found on Amazon.com and in bookstores everywhere. 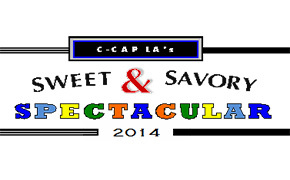 The Careers through Culinary Art Program’s (C-CAP) Sweet & Savory Spectacular benefit is this Sunday afternoon, Oct. 19th at the Art Institute of California Los Angeles campus in Santa Monica. C-CAP Advisory Board member Eric Boardman previews the event. Eric is an accomplished Food Television personality and producer (Food Network’s “Calling All Cooks”) and will be MCing the Sweet & Savory Chef’s Challenge at the Benefit. There is live music in the Crab Shell Bar. Chef Nick is also an accomplished mixologist. Part of the repositioning of the Venice Whaler is a new emphasis on specialty handcrafted cocktails made with fresh ingredients. For Valentine’s Day the original Zov’s Bistro in Tustin has a choice of their classic entrees for dinner including an 18 oz. bone-in rib-eye steak. We’re celebrating everything from the 1st Anniversary of the Seoul Sausage Co. to incredible gourmet popsicles containing real fruit made in Old Towne Orange.